Cyclepalooza | The Ice Cream Ride Bicycle Tour – SOLD OUT! 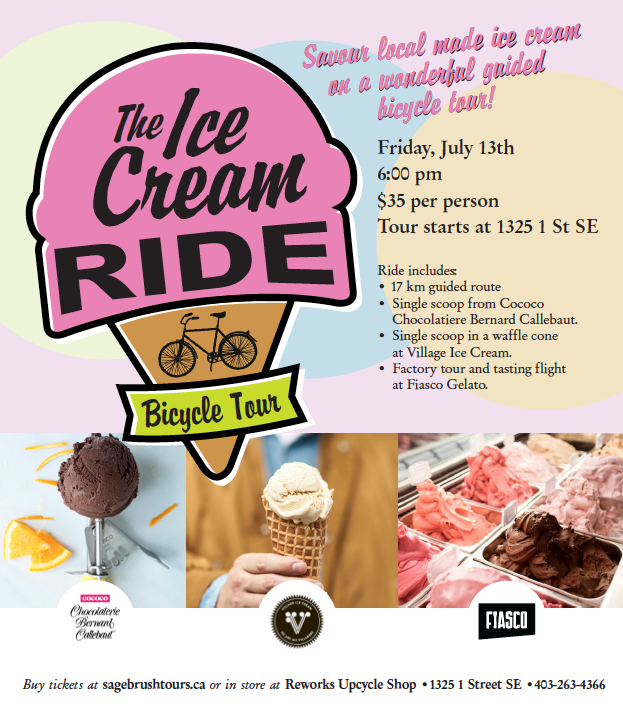 The Ice Cream Ride Bicycle Tour - SOLD OUT! Savour local made ice cream on a wonderful guided bicycle tour hosted by Reworks Upcycle Shop and Sagebrush Tours. Tour includes 17 km guided route, single scoop from Cocoa Chocolatiere Bernard Callebaut, single scoop in a waffle cone at Village Ice Cream and a factory tour & tasting flight at Fiasco Gelato. $35 per person. Buy tickets at sagebrushtours.ca or in store at Reworks Upcycle Shop, 1325 1 Street SE. Disclaimer: The Cyclepalooza calendar is presented as a convenience for cyclists. Cyclepalooza is neither responsible for nor endorses the activities listed, except where otherwise indicated. Cyclepalooza would like to acknowledge that all events hosted take place on the traditional territories of the Blackfoot and the people of the Treaty 7 region in Southern Alberta, which includes the Siksika, the Piikuni, the Kainai, the Tsuut’ina and the Stoney Nakoda First Nations, including Chiniki, Bearspaw, and Wesley First Nation. The City of Calgary is also home to Métis Nation of Alberta, Region III.